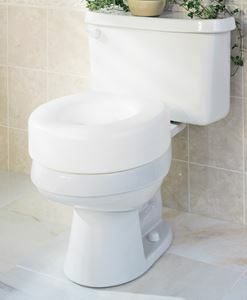 Toilet Seat Riser by Medline Canada is designed to for those with trouble sitting down and getting out from the toilet. Its design is simple and made of polypropylene resin which makes it easy to clean. Features slip resistant pads for extra stability. Fits most of the toilets. Can hold upto 250 lbs. Seat can be raised upto 5" above the toilet seat.